This illustration shows you how to find Delta (δ) Cephei in the May night sky. 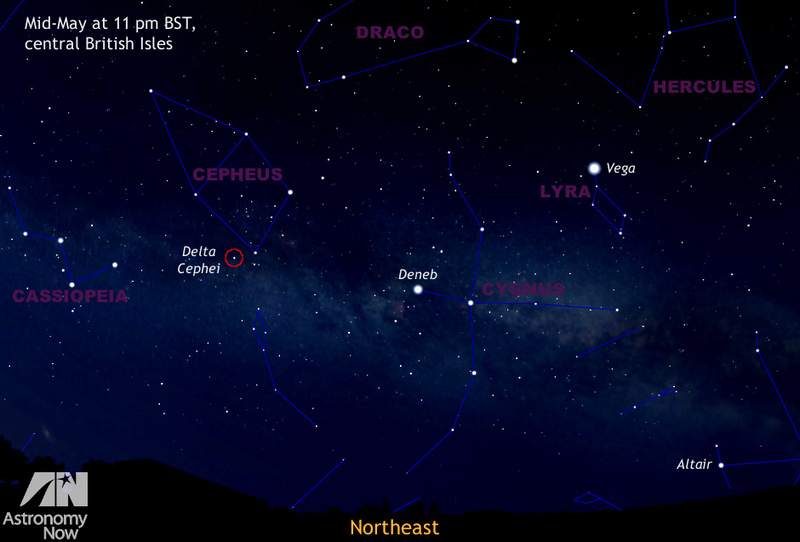 It represents a quadrant of sky centred on northeast as seen from the centre of the British Isles mid-month at 11 pm BST. AN graphic by Ade Ashford. To measure distances in the universe, astronomers use Cepheids, a family of variable stars whose luminosity varies with time. Their role as distance calibrators has brought them attention from researchers for more than a century. While it was thought that nearly everything was known about the prototype of Cepheids, named Delta (δ) Cephei, a team of researchers at the University of Geneva (UNIGE), the Johns Hopkins University, and the European Space Agency (ESA), have now discovered that this star is not alone, but that it has a hidden companion — a revelation published in the Astrophysical Journal. 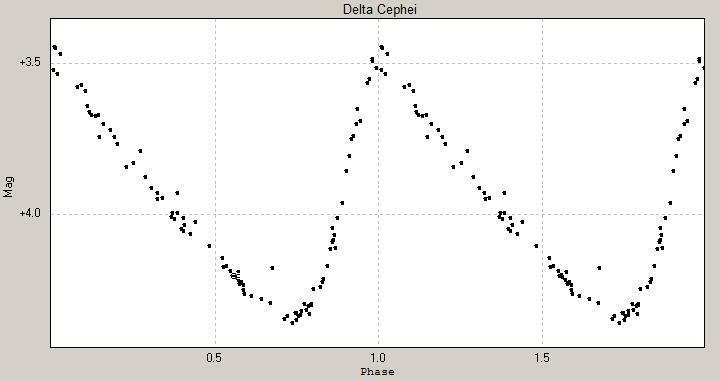 Light curve of Delta Cephei showing magnitude versus pulsation phase. The star varies from magnitude 3.48 to 4.37 over a period of 5.366341 days. Image credit: ThomasK Vbg [CC BY-SA 3.0], via Wikimedia Commons. Delta Cephei, prototype of Cepheids, which has given its name to all similar variable stars, was discovered 230 years ago by the English astronomer, John Goodricke. Since the early 20th century, scientists have been interested in measuring cosmic distances using a relationship between these stars’ periods of pulsation and their luminosities (intrinsic brightness), discovered by the American Henrietta Leavitt. Today, researchers from the Astronomical Observatory of UNIGE, the Johns Hopkins University, and the ESA show that Delta Cephei is, in fact, a double star, made up of a Cepheid-type variable star and a companion, which had thus far escaped detection, probably because of its low luminosity. Yet, pairs of stars, referred to as binaries, complicate the calibration of the period-luminosity relationship, and can bias the measurement of distances. This is a surprising discovery, since Delta Cephei is one of the most studied stars, of which we thought we knew almost everything. As the scientists from Geneva and Baltimore measured Delta Cephei’s pulsations with the Hermes spectrograph, installed at the Mercator telescope based on La Palma, one of the Canary Islands, an unexpected signal was detected. Using high-precision Doppler spectroscopy (developed and used for researching exoplanets), the researchers discovered that the speed with which Delta Cephei approaches the Sun is not constant, but changes with time in a characteristic fashion. This change of speed can only be explained by the presence of another star, which orbits around Delta Cephei. In other words, there is a secret companion, whose existence we did not suspect. By combining their own observations with data from the scientific literature, the researchers determined the orbit of the two stars and observed that the mass of the companion is low (around 10 times lower than the mass of Delta Cephei). “We were shocked: despite all the attention Delta Cephei was given over the years, we were lacking an essential piece of information,” states Richard Anderson, researcher at UNIGE at the time of the discovery, first author of the article and now researcher at Johns Hopkins University, in the United States. 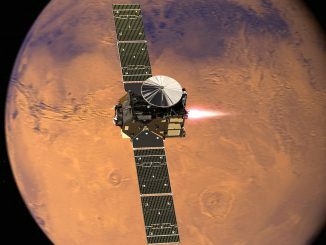 According to the scientists, the data collected in the framework of ESA’s Gaia space mission will enable Delta Cephei’s orbit to be precisely measured. The presence of the companion must consequently be taken into account when the Gaia team determines the Delta Cephei’s distance. This image layout illustrates how NASA’s Spitzer Space Telescope was able to show that Delta Cephei — a “standard candle” used to measure cosmological distances — is shrinking, a finding that affects precise measurements of the age, size and expansion rate of our universe. 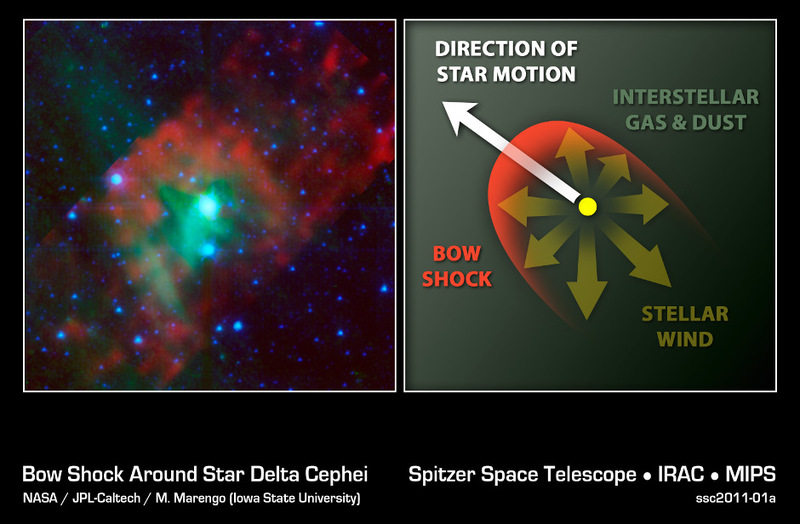 The image on the left, taken by Spitzer shows that the star has a bow shock in front of it. This can be seen as the red arc shape to the left of the star, which is depicted in blue-green (the colours have been assigned to specific infrared wavelengths we can’t see with our eyes). The presence of the bow shock told astronomers that Delta Cephei must have a wind that is forming the shock. This wind is made up of gas and dust blowing off the star. Image credit: NASA/JPL-Caltech/M. Marengo (Iowa State). Due to its eccentric orbit, Delta Cephei is sometimes further and sometimes closer to its companion. This suggests a very dynamic evolution, since the two stars are approaching each other to within twice the Earth-Sun distance (astronomical unit) every 6 years, which is a small distance for a Supergiant star such as Delta Cephei whose radius is 43 times larger than that of the Sun. Delta Cephei’s eccentric orbit thus points to interactions between the two stars due to tidal forces that occur when they are close to each other. This could help the interpretation of other astronomers’ work in the past, who have observed a strange circumstellar environment, for which no definitive explanation has been found yet. 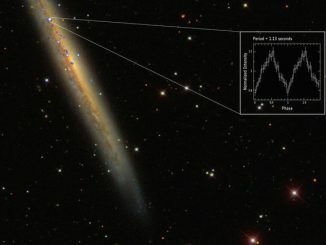 ESA’s XMM-Newton has found a pulsar – the spinning remains of a once-massive star – that is a thousand times brighter than previously thought possible. 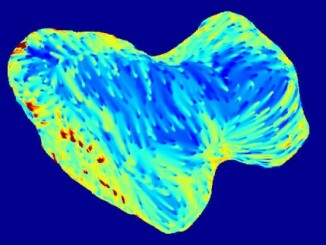 Since its arrival at comet 67P/Churyumov-Gerasimenko in August 2014, ESA’s Rosetta spacecraft has been surveying the surface and the environment of this curiously shaped body. Now that the comet is experiencing a brief, hot southern hemisphere summer, its south polar regions have emerged from almost five years of total darkness and it has been possible to observe them with other Rosetta instruments.